It all started with a croissant. A real French croissant from a pâtisserie in Paris that started this obsession I have with baking. Whatever “croissants” I’d had in Canada never had the same effect. I’ve always enjoyed baking, but it wasn’t until I moved to France that it turned into something a little more than just an occasional pastime. Naturally, with my growing interest in baking, I wanted to know how I could make croissants myself. This would be absolutely necessary for my eventual return to Canada, where I would no longer have a zillion French pâtisseries in close proximity, with croissants just waiting to be eaten (by me.) Croisssants were my downfall in France. Many go for the wine, cheese, and bread, but not me. Croissants all the way. Don’t even think about offering me a pain au chocolat instead. I began searching for pastry courses in Paris, but to my surprise, I couldn’t find any French ones. Apparently the French aren’t too interested in learning to make pastries that they can obtain so readily. 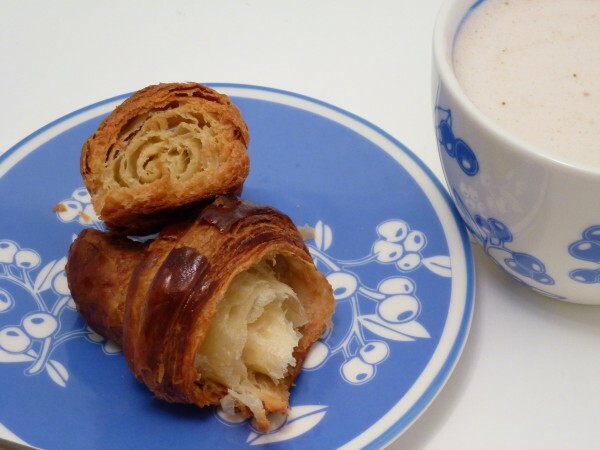 The only French pastry courses I could find were at culinary schools for those becoming pastry chefs, which on my income, was just not going to happen. Luckily, I came across an English-speaking cooking school in Montmartre called Cook’n with Class. Let me take this opportunity to rave about how awesome they are. Cookn’ with Class is mainly geared toward tourists, or English-speakers living in France. It is rated as one of the top things to do in Paris by TripAdvisor. So if you are going to Paris, YOU MUST check them out. They have all sorts of classes which teach you how to make pastries, bread, macarons, and lots of other French delights. I had such a fun time, met some great people, and learned a lot! For more information about Cookn’ with Class check out their website. I was lucky to have such a knowledgeable and fun teacher, Pino Ficara. He patiently answered all my questions (there were many) and even responded to my numerous emails (with even more questions) once the course was over. If you would like Pino to teach you the ways of croissant making, but are unable to make it to Paris, here is his youtube video on croissants. Otherwise, you can see my adapted version of his recipe below. 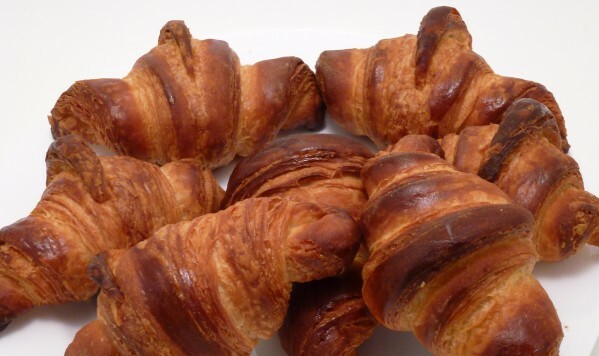 1) Croissants have a reputation for being quite difficult to make. I wouldn’t say they are difficult, but just very easy to mess up. If you’ve never made croissants before, chances are you will encounter some problems before you make an exceptional batch. I still mess up occasionally when I make them, but take my screw-ups as learning opportunities. For instance, when you check on your croissants and think “these are looking good, I will just leave them in there a few more minutes,” don’t forget about them and leave them in the oven for another 15. Croissant dough is similar to puff pastry, as both have many butter layers and rely on steam to puff them up (you may remember this from my puff pastry post.) However, croissant dough is also leavened with yeast, whereas puff pastry is not. This gives the croissants just an extra bit of flavour that makes them irresistible to me. Warm milk so that it is approximately body temperature. Sprinkle yeast on top and allow to sit for ~5 min. In the meantime, whisk together flour, sugar, and salt. Whisk milk to dissolve yeast, and then add to flour. Mix the dough, being careful to not over-mix or knead the dough. We aren’t making bread here. If you overdevelop the gluten, you will end up with dough that is difficult to roll out and chewy croissants. 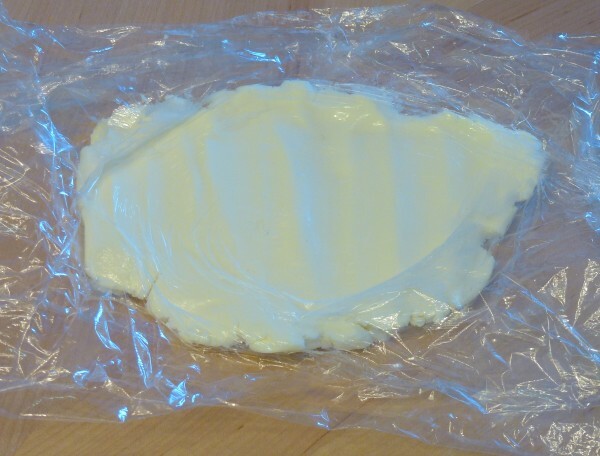 Wrap in plastic and refrigerate 8 hours (or overnight.) I’ve had this dough explode in the fridge more than once so make sure you use several layers of plastic wrap. You’ve been warned. 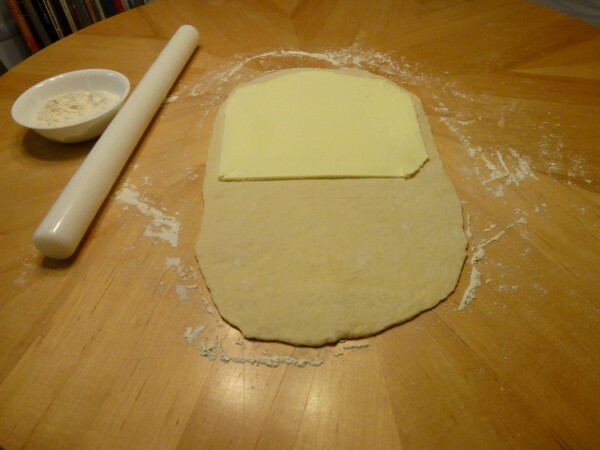 Use a rolling pin to pound the butter so that it is a bit softer to work with. Once you get it as thin as possible, roll it out into a thin sheet. Work quickly so the butter doesn’t get too soft or begin to melt. I used plastic wrap while pounding the butter and then rolled the butter with flour and wax paper to prevent sticking. If you are finding it difficult to roll out the entire block of butter, you can cut the butter into smaller chunks (approx. 50 g each) and roll them out separately (you will have to make a patchwork with the smaller pieces later on but it will still work.) Transfer the rolled out butter to the fridge to cool until the dough has finished resting. Once the dough has rested for 8 hours, unwrap and roll out into a rectangle that is approximately the size of an average cookie sheet. 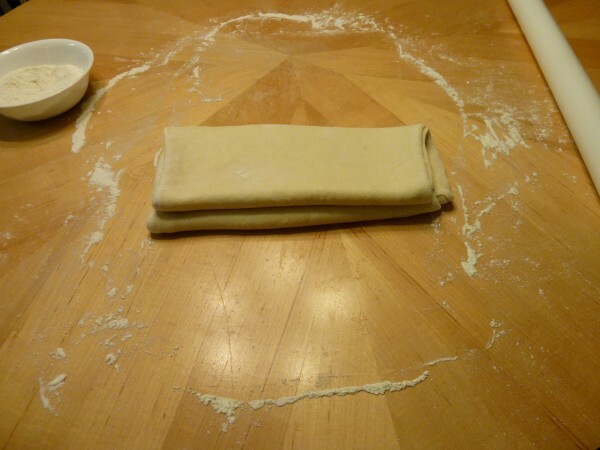 You want to use enough flour for rolling so that the dough doesn’t stick, but don’t go overboard. Excess flour can burn during baking. Working quickly so the butter doesn’t melt, spread the butter sheet over 2/3 of the dough rectangle. Leave a border around the edges of the butter. 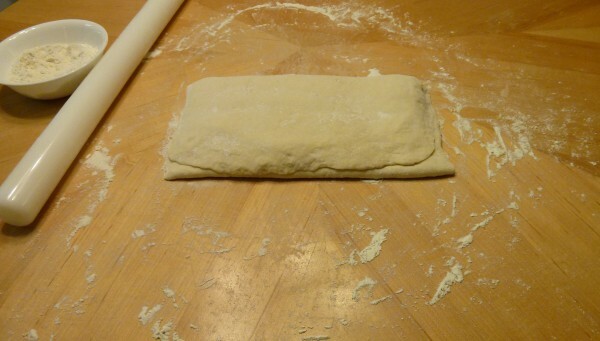 Do a letter fold, sealing together the edges of the dough. Rotate so that the “spine of the letter’ is on the left. 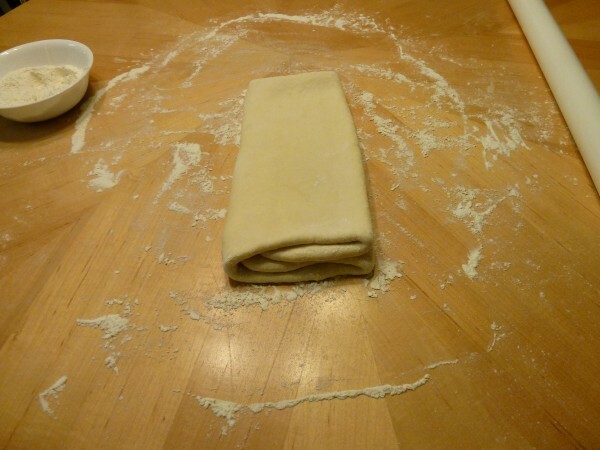 Pound dough with rolling pin to soften the butter and then roll out into another rectangle, approximately the size of a cookie sheet. Perform a double turn or book fold. Rotate so the “spine” is on the left again. 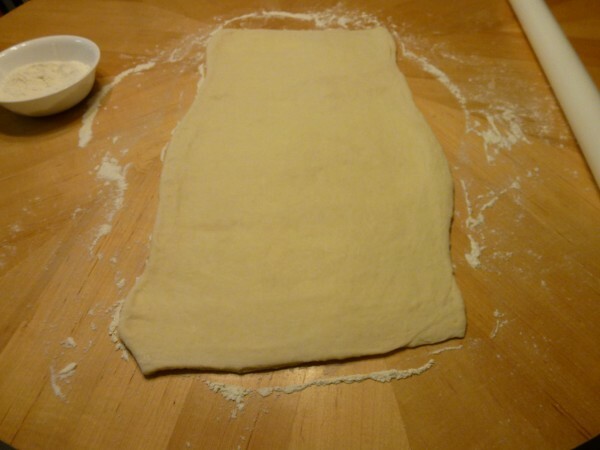 Once dough has rested in fridge, cut the dough in half. Return half to the fridge and roll out the other half. Using a sharp knife, pizza cutter, or croissant cutter, cut the dough into triangles. 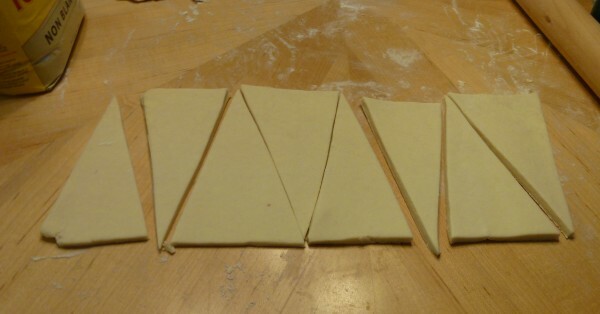 To roll up croissants, cut a small slit in the bottom of the triangles. 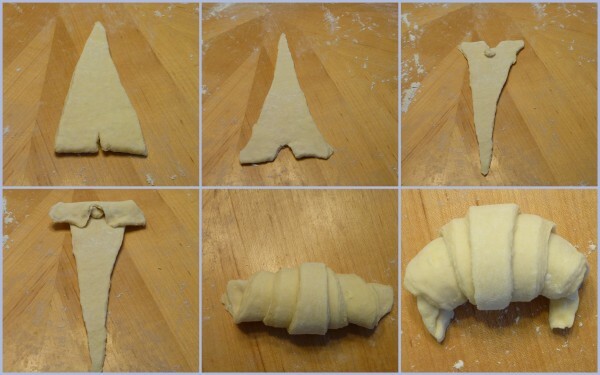 Stretch the dough a bit to make the triangles into mini Eiffel Towers. Take a small piece of scrap dough and place it on the triangle. Fold the “flaps” over the dough and roll up the croissant. Lightly brush croissants with egg wash and allow to rise on parchment-lined baking sheets until spongy (30 minutes to 1 hour). Brush one more time with egg wash right before baking. Be careful to not go overboard with the egg wash. Too much egg wash and your croissants will not rise as well and could become too crispy. Bake for 10 minutes at 400 F (200 C) and then reduce heat to 350 F (175 C) and bake until brown and crispy. 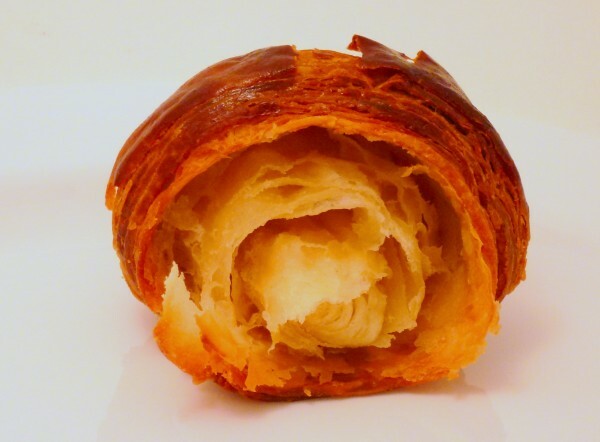 All the layers should be visible inside the croissant. Croissants do not keep for very long (at most 1 day.) They are at their best when freshly baked, otherwise freezing works well too. Wait until croissants are thoroughly cool and store in a ziploc bag with all excess air removed. Remove from freezer and immediately heat in oven at 350 F (175 C) for 3-5 min before serving. © 2019 The Big Bake Theory. All Rights Reserved.